Villa Sinfonia is designed for those students who have graduated from the Suzuki Book 4 Group and for qualified adults. While the preparatory classes teach the students to play as a group with each other, the Villa Sinfonia adds a new dimension to the formula by thrusting the students into a full string orchestra where they learn to play together as a section. This musical multitasking grows with experience to create some wonderful musicians. The conductor is Roy Oakley. This is a smaller orchestra for advanced students that will perform on a professional concert series. It meets for two hours twice a month. 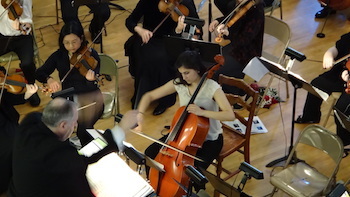 The Villa Chamber Orchestra, not to be confused with the Villa Sinfonia, consists of the more advanced students featuring more challenging music performed in a professional concert series. Meeting for two hours twice a month, this group takes what they learned in the Villa Sinfonia to new heightened levels as they rival other professional groups in their musical prowess. The conductor is Roy Oakley.